Online Boxing is a multiplayer online fighting game where you fight others online in real time. Rather than being arcade-like, the aim is at a realistic gameplay, as close to real boxing as possible. It is for us boxing fans, who have long missed a boxing game that pays tribute to our beloved sport !. Click here to play it. You need Java 1.5 or later to run it. 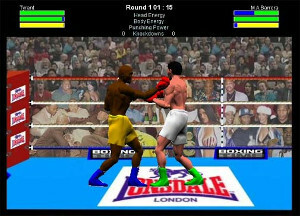 Online Boxing is also available in a 3D version.